As the world’s 1st humanitarian travel organization, Raptim started more than 65 years ago. Competition was growing. And offices around the world used different company names. Raptim really wanted everyone to come together as one. Religious groups are a majority of Raptim’s client base. But in two key markets, NGOs are the main clients. These groups are sensitive about each other. So balancing messaging and voice was crucial. 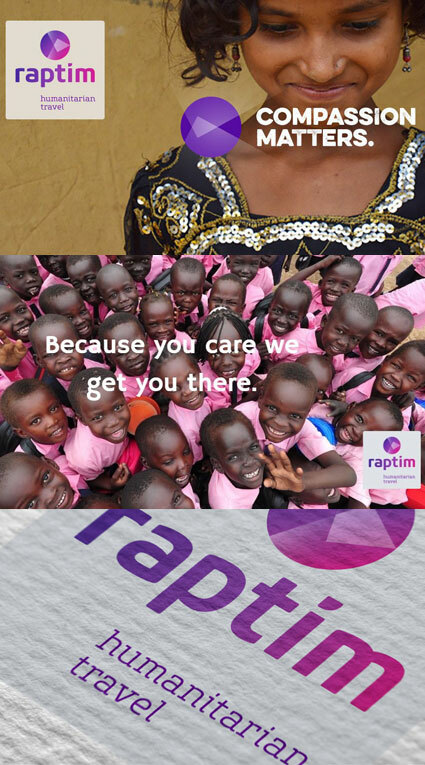 Raptim’s employee’s also had a tendency to identify so closely with their clients’ work, communications were often about humanitarian activities and issues instead of Raptim’s core business – humanitarian travel. This was an important issue to resolve. And their new tagline united the diverse target audiences and inspired a video campaign, too!